If you’ve never participated in a seder for Tu B’Shvat, you’re missing out! I want to give you the tools to host your own this year. Modeled after the Passover seder, it can be a very beautiful experience full of delicious fruits and nuts, great discussion, music, and a chance to explore your spiritual connections to the rest of creation. The preparation itself is a wonderful way to get in touch. So while you choose the fruits, wash and divide them up, be sure to pay close attention to the feel, smell, sight, and taste of each one. Each place setting should include a plate, fork or toothpicks for tasting, 2 wine cups, napkin, and a small flower pot or paper cup for planting. This is a great time to decorate your table with fresh flowers. Every seder will lead to a unique discussion about the symbolic explanations for these fruits. Go to town with it, there are infinite ways to look at it. 1st Plate. Fruits with an inedible shell. The shell conceals what is inside and also protects it. These fruits remind us of our own personalities, often hardened on the outside. It also reminds us of our connection and reliance on a world enveloped by materialism. 2nd Plate. Fruits with an inedible pit or seed. Deep inside us is where we find our truest self, this is about getting in touch with and honoring the still small voice inside us. 3rd Plate. Fruits which are edible inside and out. Is it possible to be at one with ourselves and with the world around us at the same time? Celebrate a way of living with no barriers, no holding back, and fully living an awesome life. 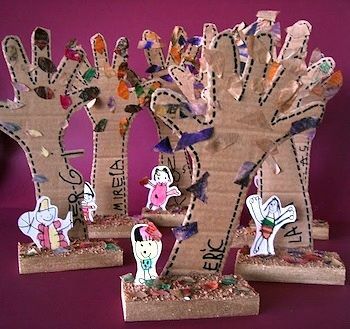 Invite your students to design their own seder plates! Delicious instillation art! 4th Plate. Instead of fruit, the 4th plate contains different seed packets for planting. We take action to make the world a better place. Think about how seeds hold the potential for new life, rebirth, hope, and change. Vegetables, Flowers and Be sure to have a pitcher of water nearby so that you can water your seeds after planting. Here are my four favorite questions that draw the connection between people and nature. Look how much we can learn about ourselves through an exploration of fruit! Feel free to make up your own questions. First I like to ask: How many colors do you see around the table? Take a long look and really count. Then I like to ask: Can you tell what makes each of the three fruit plates special and distinct? 1. Let’s look at the plate filled with oranges, bananas, nuts… What makes this plate special? These are fruits with a hard shell which we cannot eat and a soft inside which we can eat. What does this hard outer shell do for the fruit? What does it mean to be hard on the outside and soft on the inside? Do you know anyone who fits this description? Do you fit this description? Do you have a hard outer shell? Are there particular times when you have a hard outer shell or thick skin? 2. Let’s look at the plate filled with stone fruits, dates, olives… What makes this plate special? These are fruits with a soft and delicious outside and a very, very hard pit on the inside. What does that pit do for the fruit? Might we have a pit, or something like it, inside us? What could that be? How is it both a source of life and an impenetrable inner pit? What does it mean to be soft on the outside and hard on the inside? Do you know anyone who fits this description? Do you fit this description? Are there particular times when this is the case? 3. Let’s look at the plate filled with figs, berries, grapes…What makes this plate special? These fruits are edible both on the outside and the inside. What does it mean to be accessible on the outside and the inside at the same time? Do you know anyone who fits this description? Do you fit this description? Maybe we are like each of these plates of fruit at different times. Does one plate represent you more than another? Did you know you had so much in common with fruit? 4. The fourth plate is in our hands. Why is it so important for us to plant seeds? How can we people partner with the natural cycles of creation? What other kinds of seeds do you plant every day? What are your Tu B’Shvat New Year’s resolutions? 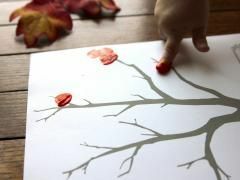 If you cannot plant seeds at this Seder, consider doing an art project that uses hand or finger prints to illustrate this connection. What are the many gifts we receive from trees every day? Why do we have a New Year holiday just to honor trees? What are your Tu B’Shvat New Year resolutions? Why is the Torah called Eitz Chayim, Tree of Life? 1st Cup. This one is just the white grape juice. It represents winter, when nature is asleep. The earth can be snow-covered, taking a rest from blooming and blossoming. 2nd Cup. This one is white juice with a little red mixed in. It represents the spring approaching and the colors of the season changing as the snow melts and flowers begin to show themselves. 3rd Cup. This is mostly red with a little white mixed in. It reminds us of summertime, and flowers in full bloom. 4th Cup. This one is all red. It represents the rich and dark fall autumn colors Leaves are changing, crops are growing, and the trees are filled with blossoms. Now you’ve got all of the tools, just add some friends and family who enjoy each other’s company and who like to eat and talk. Make a blessing over the 1st cup of juice: Baruch Atah Adonai Eloheinu melech ha-olam borei p’ri hagafen (Thank you to the Source of Life for creating the fruit of the vine). Follow this up with a short discussion of the meaning behind the color of the juice and the season it represents. Pass around the 1st plate of fruit. Make sure everyone takes a good look, feel and smell of the fruit before making a blessing over the fruit: Baruch Atah Adonai Eloheinu melech ha-olam borei p’ri ha-etz (Thank you to the Rule of the Universe that creates the fruit of the tree). Enjoy the rest of the plate of fruit along with a rich discussion of the 1st question. Follow this with round two and so on all the way through the fourth of everything. Instead of eating fruit for the fourth seder plate, take this opportunity to plant seeds. Why plant? Discuss. What questions do you ask at your Tu B’Shvat Seder?